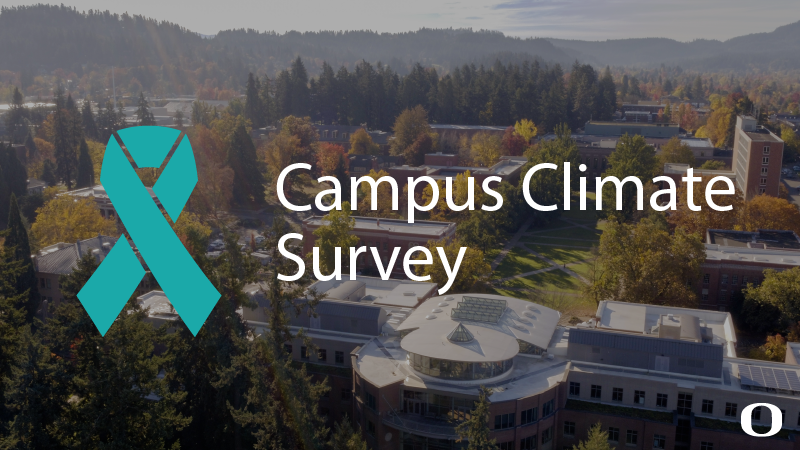 University of Oregon students will receive an email on Monday, April 8, inviting them to participate in the Association of American Universities’ 2019 Campus Climate Survey on Sexual Assault and Misconduct. The survey will be open for all undergraduate, graduate and professional students until May 10. The survey will capture the characteristics and frequency of campus sexual assault and misconduct and assess campus climate in a manner that protects student confidentiality while allowing for data sharing across universities. The study is a follow-up to the 2015 Campus Climate Survey on Sexual Assault and Sexual Misconduct, which surveyed more than 150,000 graduate, undergraduate and professional students across 27 universities. The 2019 study will include 33 universities with a combined enrollment of 870,000 students at all levels of study, and it is anticipated to be one of the largest studies of its kind. All UO students are encouraged to participate in order to capture a comprehensive view of the many different student experiences at the UO. The UO is offering a number of incentives to encourage participation, including donating $1 to the Victim Assistance Fund for every student who participates in the survey. President Michael Schill has committed to making a $5,000 matching donation if 5,000 students participate in the survey. The Victim Assistance Fund offers comprehensive support services and accommodations to help student survivors of sexual assault. For more information about the fund and survey incentives, visit the survey incentives and participation page. The Association of American Universities will publicly release aggregate results from the study. Westat will also provide each participating university with its own data. The UO will release a report on the data collected, as it did for the 2015 survey. Survey results are anticipated to be released in fall 2019. The survey may spur conversations in the classroom or elsewhere on campus, Heroy said. She encourages faculty members and staff to review the responsible reporting guidelines and resources for students available on the SAFE.uoregon.edu website. For more information on the survey, including a list of frequently asked questions, confidentiality information and information about supporting survivors of sexual assault, visit the Office of Investigations and Civil Rights Compliance website. Students who have questions or have difficulty accessing the survey can also contact Westat via email at CampusClimateHelp@westat.com or call 1-855-793-5324.